Recent dry weather across the Finger Lakes has the region well prepared for some soaking rain, which will develop from west to east starting Monday afternoon. Not only has the weather been very enjoyable over the last few weeks, but the dryness has allowed the soil to recover from the extremely wet June and early July we experienced. Now, with a soaking rain set to move through the Finger Lakes starting Monday late afternoon into Tuesday morning, flash flooding is a very minor concern. Had this same event come through in late June, when the ground was saturated, it would likely end up being another locally destructive flooding event. Thankfully, that will not be the case this time. A storm system over the Great Lakes will organize and strengthen as it pushes east today. Moisture will increase ahead of the storm system and showers will start to pop up this afternoon, especially over western New York. These showers will gradually grow into a large area of widespread rain by this evening, which will then drift east overnight and into Tuesday morning. Embedded within this area of moderate rain will be some heavy downpours and thunder. Severe or even strong thunderstorms are unlikely across the Finger Lakes. Overall, most areas across the Finger Lakes will see around an inch of rain, give or take a quarter inch. Areas in western New York and the western Finger Lakes could see a bit more as the rain develops and remains stationary for a while early this evening before starting its trek east. 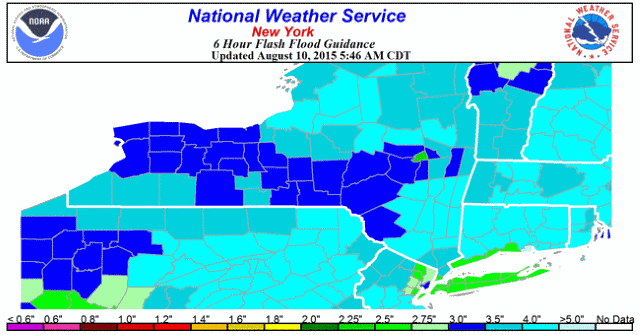 Locally, however, some areas could exceed 2 inches, thanks to the embedded thundery downpours. The map at the top of the blog shows how much rain would have to fall in a 6-hour period to cause widespread flash flooding. No less than 3 inches in 6 hours is needed for major flooding- a level that seems unlikely to be breached. 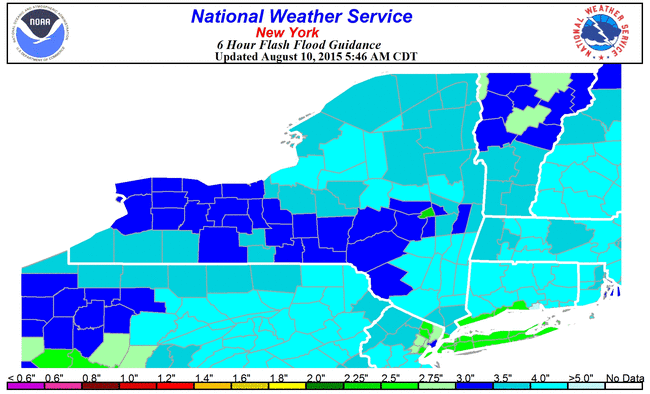 The flash flood guidance for shorter time spans (not shown) seem even more difficult to reach. This means that most small streams, rivers and drainage culverts should be able to handle the rain and downpours without overflowing. Poor drainage areas, especially in areas with large expanses of blacktop (such as shopping centers), will be the most likely to see some ponding in the heavier downpours. The rain should taper off from west to east Tuesday morning, with a few showers lingering into the afternoon. Experience tells me that areas of dense fog will develop Tuesday night, which could slow down your commute Wednesday morning.